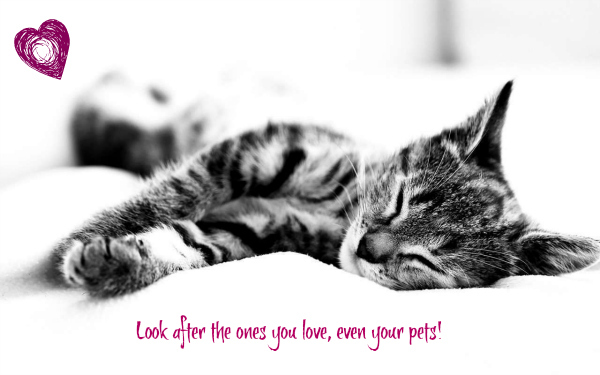 Look after the ones you love, even your pets! I don’t know about you, but my family doesn’t only consist of Amy, Ben and me, but also of our cat Honey. She’s always around and somehow has a sixth when one of us isn’t feeling well. She comes up to us, sits down on our lap and doesn’t leave until she feels that we are better. She can be cheeky at times and beg for treats but she’s there when it counts and Amy absolutely adores her. Her little face lights up as soon as she sees her trotting through the garden and as soon as we get up in the morning, she insists on feeding her. It’s too cute to see their friendship. When Amy was born, Honey was not too keen on her. She was rather wary of her and kept a close eye on her every move, but as soon as Amy started moving they started cuddling and playing with each other. I remember worrying about Honey being jealous of Amy when I was pregnant, but seeing them together now, there was absolutely no reason for it. I think she grasped at a really early stage that Amy was no threat to her and that we’d still love her and make time for her. Because we love her like any other family member, we have made sure that she is looked after in case something happens to her. If she falls ill or has an accident, we want to be sure that she receives the best possible care and that is why we have taken out pet insurance.